This work will be included as BH 432 in the forthcoming catalogue raisonné of Barbara Hepworth’s sculptures being revised by Dr Sophie Bowness. 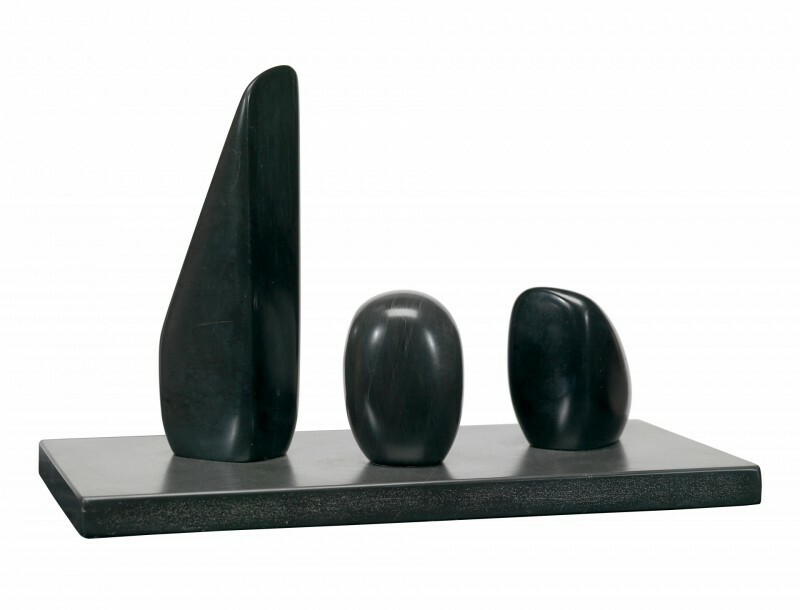 Three Forms (October 3rd) belongs to a group of exquisite slate carvings made by Hepworth in the 1960s and 1970s. Recalling the tripartite works she created in the mid- 1930s, such as the serravezza marble Three Forms, 1935 (Tate), the present work revives Hepworth’s exploration of ‘relationships in space, in size and texture and weight, as well as in the tensions between the forms.’ Characterised by a highly polished finish and depth of colour, the title of this unique work, as well as the relationship of three forms, carried special significance for the artist, referring to the birth of her triplets with Ben Nicholson on 3rd October 1934. Though limiting the amount of time she could devote to carving, Hepworth later suggested that the arrival of their children ‘gave us an even greater unity of idea and aim’. Barbara Hepworth was born in Wakefield, Yorkshire in 1903, the first of four children of Herbert Hepworth (a civil engineer) and his wife Gertrude Johnson. She was educated at Wakefield Girls’ High School before studying at Leeds School of Art from 1920, where she met the sculptor Henry Moore. After taking the two-year course in a single year, she moved to The Royal College of Art, London in 1921. Following a post-graduate year there, Hepworth was short-listed for the Prix de Rome and was awarded a year’s travel scholarship. She moved to Florence in 1924 where she married fellow student and winner of the Prix de Rome, John Skeaping in May 1925. They later moved to Rome where Hepworth received a thorough training in carving and began working with stone. In November 1926 they returned to London, moving in 1928 to 7 The Mall Studios in Hampstead. Hepworth and Skeaping held joint exhibitions at the Beaux Arts Gallery in 1928 and at Arthur Tooth & Son in 1930. Their son, Paul was born in August 1929, but their marriage had already begun to deteriorate when Hepworth met Ben Nicholson in 1931. Hepworth and Skeaping divorced in 1933. Nicholson moved into Hepworth’s studio in 1932 and they held a joint exhibition of their work at Tooth’s Gallery that same year and again at the Lefevre Gallery in 1933. A member of the Seven & Five Society, Unit One and Abstraction-Création during the 1930s, Hepworth began making entirely abstract sculpture in 1934. She also gave birth to triplets Simon, Rachel and Sarah that year. Nicholson and Hepworth were married in 1938, moving to Cornwall a year later, at first staying in the house of their friend, the author Adrian Stokes and his wife Margaret Mellis. Hepworth would remain in St Ives until her death in 1975. During the first three years of the war, Hepworth was unable to carve, though she drew at night after the domestic demands of the day. Her working conditions became easier after the family moved into a larger house in Chy-an-Kerris, Carbis Bay in 1942 and Hepworth secured a studio. The first retrospective exhibition of Hepworth’s work was held at Temple Newsam, Leeds in 1943. She represented British sculpture at the Venice Biennale in 1950 and was commissioned by the Arts Council to produce two sculptures for the Festival of Britain in 1951. Two further retrospectives in Wakefield in 1951 and at The Whitechapel Art Gallery, London in 1954 helped to confirm her Post-War reputation. Hepworth bought Trewyn Studio, St Ives in 1949 and lived there permanently from 1950 following her separation from Nicholson and their divorce in 1951. In 1953 her first child, Paul Skeaping, was killed in an air crash. Hepworth travelled to Greece in 1954 in an effort to recover from his sudden death. Large public commissions such as Single Form, erected outside the United Nations Building, New York in 1964 helped to confirm Hepworth’s international standing, as did the award of the Grand Prix at the 1959 São Paulo Biennial. She was awarded a CBE in 1958 and appointed DBE in 1965, the same year in which she was elected a Trustee of the Tate Gallery. Along with her friend the potter Bernard Leach, Hepworth was awarded the Freedom of St Ives in 1968 in acknowledgement of her importance to the town. Hepworth died in 1975 as a result of a fire in her studio. According to her wishes, Trewyn studio was opened to the public as the Barbara Hepworth Museum in 1976 and is now part of the Tate Gallery. The artist cited in Herbert Read, Barbara Hepworth: Carvings and Drawings, Lund Humphries, London, 1952. Chris Stephens cited in, Barbara Hepworth, exhibition catalogue, Institut Valencià d’Art Modern, Valencia, 2004, p.107. The artist cited in ‘Alan Bowness : conversations with Barbara Hepworth’, 1970, op. cit., p.8. Matthew Gale, cited in Gale and Stephens, op. cit., p.229.